The Village of Doaktown is located in Northumberland County, New Brunswick and discharges its wastewater to the Miramichi River. The Miramichi River once supported one of the largest Atlantic salmon populations in North America and today continues to support a large fishery. The river attracts recreational fly fisherman from all over the world. The New Brunswick Department of Natural Resources has implemented rules and regulations for fishing, as well as the wastewater effluent that is discharged into the river, in order to protect the salmon population. Implementing partial mix optAER aeration in lagoon cells 1 and 2. 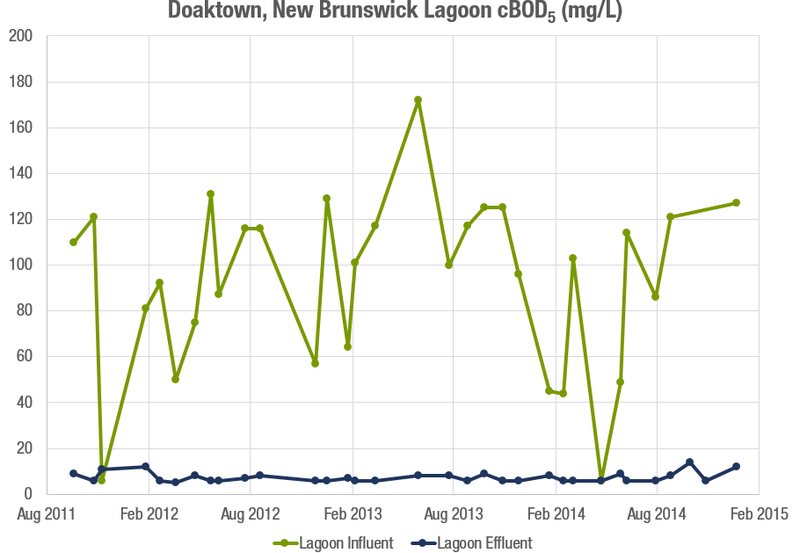 With the lagoon upgrades in place, Doaktown has been able to get its cBOD5 and TSS numbers down averages of 7.4 and 12.6 mg/L respectively, even before the water hits the SAGR that has itself been shown to remove 90%+ of both. Although this case study places the focus on the optAER-enhanced lagoon performance, the treatment objectives set targets for the effluent from the entire system, including the post-lagoon SAGR. To that end, the system has been achieving remarkable results. During the summer months, when the system targets 1 mg/L, samples have average 0.2 mg/L. But perhaps even more impressivley, in the cold of winter, when targets imposed on the system are 7 mg/L, effluent samples have averaged less than 0.9 mg/L.